Today’s post and this grain-free Polka Dot Chocolate Cake with Chocolate Almond Butter Frosting recipe comes from Starlene over at GAPS: A Food Experiment. Starlene writes about her journey on the GAPS diet at her blog, but on occasion comes up with a recipe that isn’t fully “GAPS legal,” so she asked me if I would host this gluten-free, grain-free, refined sugar-free recipe here at gfe. I’m so happy to oblige, especially when the recipe featured is as gorgeous and mouth watering as this one! Note that this cake might also be considered paleo and/or primal by those who include butter in those diets. Who doesn't love polka dots? This delicious paleo chocolate cake recipe uses a super easy and natural way to add polka dots to this treat. Such fun for a special occasion! Preheat oven to 350°F. Gently whisk cocoa into the almond flour, then add the salt and baking soda, whisking again. In a different bowl, mix the wet ingredients together: honey, eggs and vanilla extract. Pour the wet into the dry and stir just until fully mixed. Butter an 8-inch cake pan (the kind with the little piece that goes around to help release the cake works best) and flour lightly with almond flour. Don't forget to flour with almond flour as this cake will stick. Bake for 20-25 minutes. The texture of the cake will be brownie-like. Mix the frosting ingredients together. Frost the cake when it has cooled for about fifteen minutes. Frosting it while warm helps the frosting spread easily. The frosting is just enough for a one-layer cake. Serves eight. This cake is very rich and decadent. Also tastes great frozen for twelve hours.Cake portion of this recipe is adapted from Elana Amsterdam's The Gluten-Free Almond Flour Cookbook. Frosting recipe is an original recipe from Starlene. The ice cream shown in the photo is Elana's Vegan Vanilla Ice Cream. Shirley here: Many thanks to Starlene for sharing her beautiful grain-free Polka Dot Chocolate Cake. I, for one, can’t wait to try this recipe! I’ll substitute coconut oil or another dairy-free equivalent (like(Earth Balance) for the butter in the Chocolate Almond Butter frosting to make a gluten-free, dairy-free version of this cake. This recipe is linked to Hearth and Soul Blog Party. Starlene–It was my pleasure! It’s such an amazing recipe … I, like others, LOVE it. Yep, I understand … when a non-raving husband raves, that’s phenomenal! *drool* this looks fabulous! I can’t wait to make it. Hey Jayme–I know I’ve visited your blog before, but it looks like you are new to commenting here–welcome! 🙂 I couldn’t agree more … *drool* indeed, or maybe *DROOL*. LOL Can’t wait to hear your report! waw,..I am truly gobsmacked here!! what a stunning cake & just look at those georgous polka dots!! MMMMMMMMMMMM,…and gluten free & easy to make too! Yum! That does look rich and decadent! It’s more “torte-like” than cake-ish. GFE for sure! Simple ingredients, simple instructions. I love it. Hey Melissa–Those were Starlene’s words, but they could have easily been mine. I raided the freezer a couple of weeks ago and hit up a failed PB and chocolate recipe. It certainly didn’t take like a failed recipe as I was eaten those frozen bits! There is no safe haven for these types of treats! Oh my! This looks delicious – I’d make it right now if not for the fact that I have to get more cocoa powder still, plus almond flour. I have it on my “things to make” list. My family would love it! I like the idea of an almond butter frosting, too. Well done! Hey Zoe–I just discovered that I’m out of cocoa, too. Now that is worth a trip to the grocery store! A girl must have her chocolate treats. Luckily, I still have a good supply of almond flour. Hope you and your family enjoy it when you have all the ingredients and the timing is right. 🙂 Bravo to Starlene, huh? BTW, I added a reminder to my latest post on the GAHIGF roundup. Hope it helps! This cake looks wonderful! 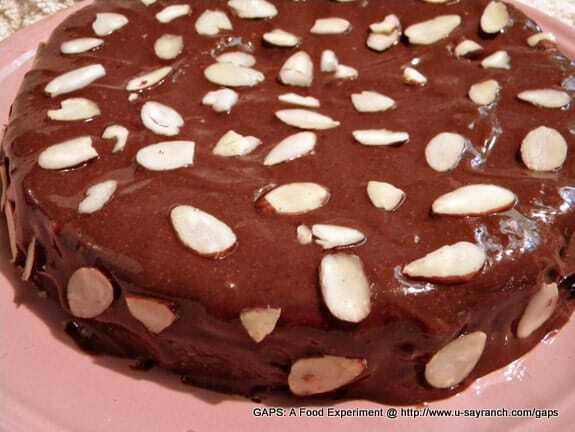 Almonds and chocolate are one of my favorite combinations. I’m looking forward to trying this recipe. This looks lovely! Will be putting it on my list of recipes for special treat days. I also have been known to have a frozen treat along with Melissa-the black bean GF brownies are fabulous out of the freezer! Hey Erin–Yes, special treat day worthy for sure! If we all lived close together, it would be safe to make this and cut it into about 16 smallish slices. But for an every day indulgence with just our home peeps, it’s probably not a wise idea. 😉 I love Starlene for sharing it with us though. Oh, and we all love our frozen gf treats, don’t we? 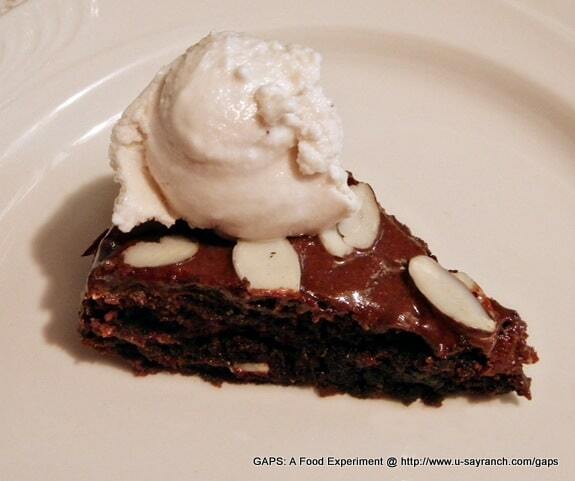 Black bean brownies rock in any form IMHO! Thank you everyone for all the lovely compliments! I decided to check today and see if anyone else commented and wow, I am just sitting here grinning. I feel so honored! Thanks again Shirley for hosting my recipe! I have banned myself from making it until another special holiday, it is so delicious! I don’t remember seeing this one before, Shirley. I love the polka dots, and of course that it’s grain free. Linda–I’ve found quite a few recipes recently that seemed to go under the radar when they were first published. 😉 I was happy to share this one on Gluten-Free Wednesdays this week to ensure that you and others would see it. Yes, those are my kind of polka dots and I love the grain-free factor in this recipe, too. 🙂 I’d also like to make the frosting and it would be easy to make it dairy free. Starlene created a great recipe with this cake for sure. 🙂 Thanks for hosting Gluten-Free Fridays, dear! Ninja Baker–Yay!! I’m so happy to give you a recipe that will work for your husband. 🙂 I also really appreciate you sharing this post on Twitter and Pinterest! Shirley, I’m so glad you hosted Starlene’s recipe – what a delicious cake! It looks so moist and tasty and I love the frosting. Sharing! Thank you so much for being a part of Hearth and Soul.